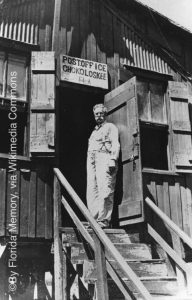 Dave Lapham, author of Ghosthunting Florida, puts the spotlight on the tiny village of Chokoloskee. Nestled deep in the Everglades among the Ten Thousand Islands along the southwestern Gulf coast of Florida is the tiny village of Chokoloskee. It is at the end of the road—literally. You can’t get any farther south except by boat. And at the end of the one main road in Chokoloskee is the Smallwood General Store, sitting on stilts, the waters of the Gulf lapping against its pilings as they have for over a hundred years. It was here on the shore next to Smallwood’s that Ed Watson met his demise in 1910. Ed Watson had come to the area several years before and was farming very successfully on forty acres a few miles south on the Chatham River. He was a quiet, angry man who kept to himself, but was often in trouble with the law because of his violent temper. He had many enemies in the neighborhood. Because he was so standoffish, he was cloaked in mystery. No one knew much about him. Folks wondered how he was able to do so well with his farm in such a hostile environment, until disemboweled bodies began showing up in the waters around Watson’s farm. Someone finally figured out that he had been hiring migrant workers and then killing them instead of paying them, disposing of their bodies by burying them on his farm or feeding them to the alligators. The local sheriff formed a posse and proceeded to Watson’s place to arrest him. Watson wasn’t home, but the posse found a mass grave with dozen of bodies and body parts. Back at Smallwood’s, the posse waited for Watson to show up. Because of the gruesomeness of the apparent murders, they dispensed with normal legal proceedings and shot him dead as soon as he appeared. Many of the locals think Smallwood’s is haunted by Ed Watson and that it’s not safe to go among the pilings under the store. Maybe that’s true, but there is no doubt that Watson’s old place is filled with the ghosts of his murder victims. Many people have tried to make a go of the farm, but very little ever grew there after Watson died, and everyone has been overwhelmed by the ghosts. After many years, an old woman moved into Watson’s house. She, too, encountered the phantoms, and one night, while trying to fend them off with a lighted knot torch, burned the place to the ground. Since then, snakes and vegetation have reclaimed the farm and the house. Ed Watson may or may not be around, but the ghosts of his many victims still certainly occupy that forty acres on the Chatham River a few miles south of the Smallwood General Store in Chokoloskee. 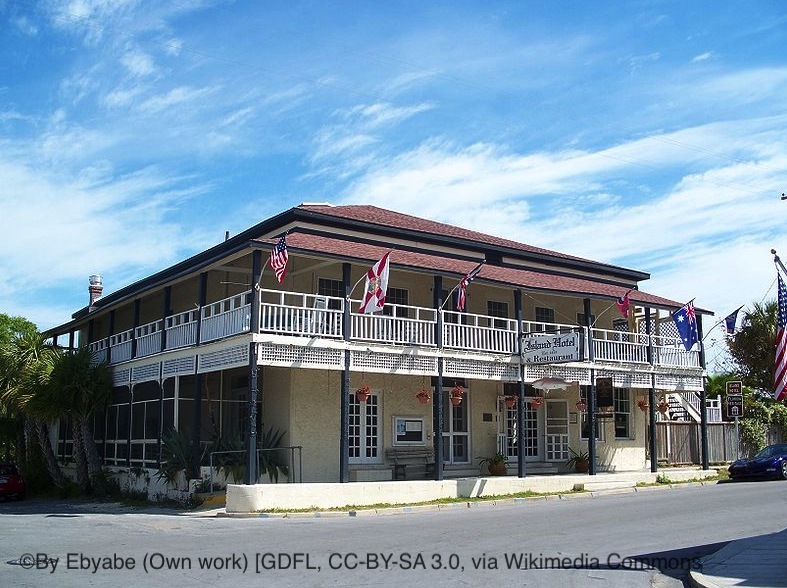 In his book Ghosthunting Florida, author Dave Lapham visits more than 30 legendary haunted places in the Sunshine State, all of which are open to the public so visitors can test their own ghost hunting skills. 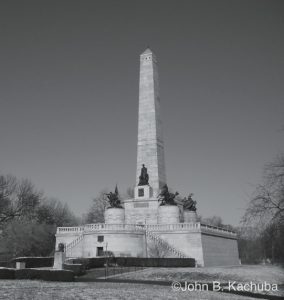 John B. Kachuba, author of Ghosthunting Illinois recommends a visit to these three Abraham Lincoln historic sites in Springfield, Illinois. The sites are said to be haunted. And what better place for a ghosthunter to lay his or her weary head than at the haunted and beautiful Inn at 835? 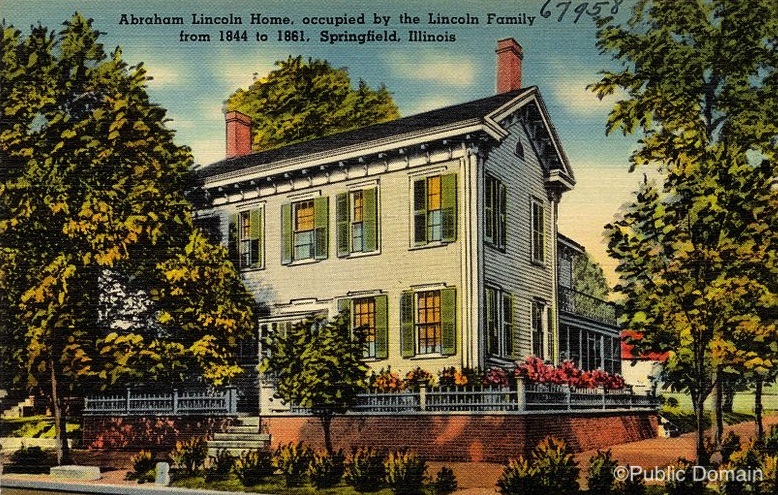 The Lincoln Home looks exactly as the Lincolns left it when they departed Springfield in 1861, heading for Washington, D.C. Period furnishings recreate the everyday life of the family. Several blocks of reconstructed buildings surround the house, giving the visitor the sense of stepping back in time to Lincoln’s day. Opening hours : 8:30am-5:00pm, daily, except on Thanksgiving Day, Christmas Day and New Years Day, when the park is closed. For more information visit the website. Oak Ridge Cemetery is located at the end of Monument Avenue. It’s easy to find since there is plenty of street signage marking the way. It’s impossible to miss the tomb once you’ve entered Oak Ridge. Follow the signs to the parking lot and walk a hundred yards or so to the tomb. The tomb is open daily from 9:00 a.m. until 5:00 p.m. For more information about the tomb and Oak Ridge Cemetery visit the website. The Old State Capitol is easily accessed from either Fifth or Sixth Street. Its red dome is a distinctive landmark. An underground parking garage is below the capitol. After touring the capitol building, it’s a short walk to the Lincoln-Herndon Law Offices and the Illinois State Historical Library. 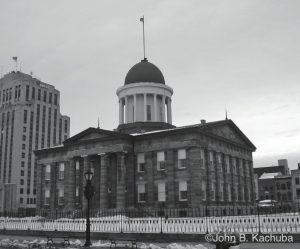 For opening hours and more information visit the website of the Old State Capitol. 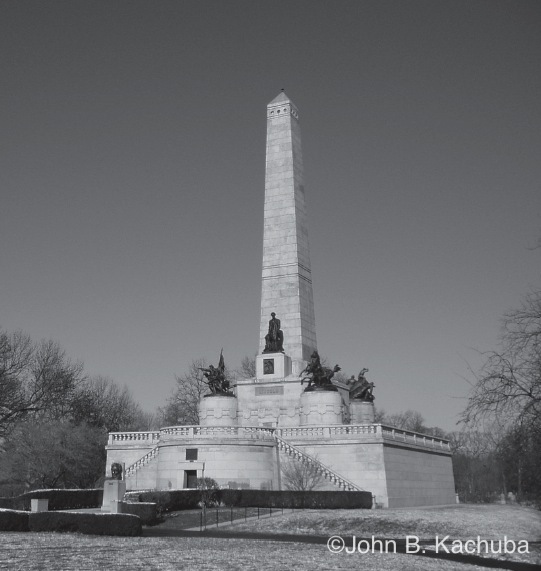 Where to stay when visiting the Abraham Lincoln historic sites in Springfield, Illinois? What better place for a ghosthunter to lay his or her weary head than at the haunted and beautiful Inn at 835? It’s conveniently located in the center of the city, close to many other historic sites, some of them haunted. Innkeeper Court Conn can direct you. For more information and reservations visit their website. Dave Lapham, author of Ghosthunting Florida, puts the spotlight on the Island Hotel at Cedar Key. Cedar Key is a really cool place. Old Crackers say that Cedar Key is like Key West was fifty years ago. I don’t know, but I do know that, although I really love Key West, I’m always enchanted by Cedar Key, where Sue and I go often to rejuvenate. No laptops. No cell phones. We don’t even watch TV when we’re there. Just the two of us on a laidback island where time doesn’t mean much, and what is happening in Washington or Wall Street doesn’t have much relevance. On her first visit to Cedar Key—she and her husband had just discovered the island—Rosemary woke early on Sunday morning and decided to go for a walk. The weather was balmy with a gentle breeze blowing off the Gulf. Few people were about, and she was enjoying the morning. She walked down Second Street intending to turn right on A Street and walk around the pier. As she strolled along, she saw an attractive couple seated at a table across the street at the Island Hotel. The woman was wearing a beautiful, lavender dress and hat, the man a suit with a high celluloid collar. Both were nicely attired, but Rosemary thought it odd that their clothes looked as if they were from the Gay Nineties. Oh well, perhaps they were here dressed for a period event. She waved to the couple. The lady smiled at her and raised her tea cup. Rosemary went on. After swinging around the pier, she decided that she’d go back up Second Street and down Third Street just to see the sights. This time as she passed the Island Hotel, she saw no one. There was no table in front or any room for one, only dirt and broken concrete. Curious, she crossed the street and went into the hotel. No breakfast was being served; the dining room was closed. The receptionist sat half asleep at the desk. There was no activity at all. It was then that she realized she’d seen ghosts. Rosemary and her husband have been back many times, and she has yet to see the lady in lavender. Still, she has always been satisfied. The island is so haunted, she has no problem running into spirits. When self-taught lawyer Abraham Lincoln rode his horse into Springfield, Illinois, in 1837, all his meager belongings were packed into two saddlebags. 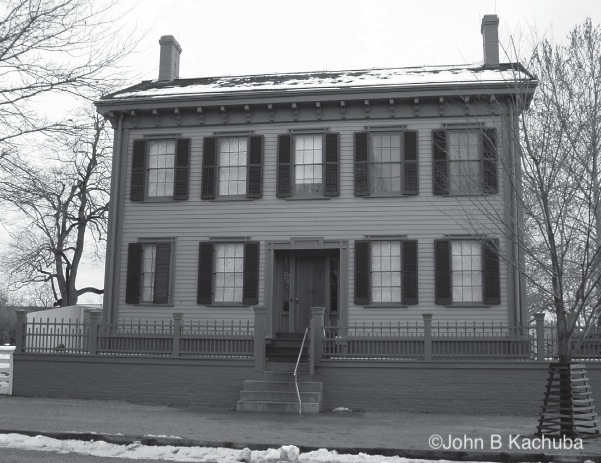 Five years later, the rising young attorney married Mary Todd, a well-educated woman from a prominent Kentucky family, and in 1844 the Lincolns paid $1,500 for a Greek-Revival cottage at the corner of Eighth and Jackson Streets. For the next 17 years, the house—considerably enlarged by Lincoln— sheltered the growing family. Three of his four children were born there, and one of them, Edward, died in the house at the age of 4. On February 11, 1861, the Lincolns left Springfield by train, headed for Washington, D.C., where Lincoln would be sworn in as the 16th President of the United States. He never again saw his Springfield home, but in 1865 his somber funeral cortege passed by the house, decked out in black-and-white bunting, as it made its way to Oak Ridge Cemetery, where the murdered president was laid to rest. 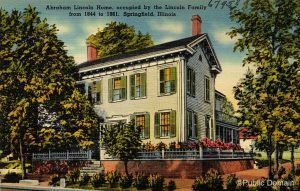 Since then, some visitors to the Lincoln home have reported seeing a tall, thin apparition with a little boy, perhaps Abe and little Edward. 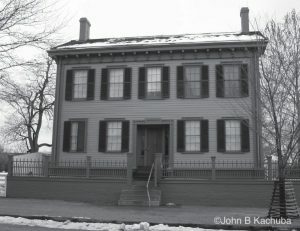 Most visitors who experience a paranormal event in the house, however, say that it is the ghost of Mary Todd Lincoln who lingers there, in the place where she lived the happiest years of her adult life. That mirror is not in the Springfield house and is lost to history, as are many of the personal items owned by the Lincolns during that time. Lincoln sold most of his furniture when he moved to Washington, and a good portion of it ended up with owners in Chicago, where it was destroyed in the 1871 fire that almost obliterated that city. Shirlie also reported seeing the rocker in the parlor move and said that she could feel “wind rushing down the hall,” despite the fact that all the windows in the house are kept tightly shut. Perhaps if someone can persuade the National Park Service to have a more open mind about the world of the paranormal, we will be able to determine whether it is old Abe, Mary, Edward, or all three who haunt the Lincoln home. Until that time, visitors to the home will just have to try to figure out the mystery for themselves. We’re all familiar with the legend of Sleepy Hollow and the terrifying headless horseman who stalked the local community in the story, but did you know that Texas has a headless horseman of its own? The legend of El Muerto, or the “Dead One,” stretches back to the days of cattle rustlers and outlaws, dirt trails and cowboy fights. While some believe him to be merely a product of myth, there are those who claim he might have actually existed. In 1850, one of the most famous of all Texas Rangers—Bigfoot Wallace—allegedly captured a Mexican outlaw simply known as Vidal, who had been raiding ranches and stealing cattle and horses. Texas Rangers had long been working to keep the incidents of theft at a minimum, but outlaws continued to sweep across the south. Rangers had done everything they could to send a clear message that thievery would not be tolerated, but their efforts had been largely unsuccessful. Bigfoot Wallace reportedly executed Vidal upon his capture, tied his decapitated head and sombrero to the saddle horn of a wild mustang, secured his body in the animal’s saddle, and sent the horse out to roam the plains. Cowboys began to see the horse and its unfortunate rider aimlessly wandering through the hills and became so afraid that they shot at it with their guns. Over time, El Muerto became an omen of bad things to come and was credited in stories of the misfortunes of others. Once the horse had been cornered in present-day Uvalde, Texas, the body of the one-time rustler was finally laid to rest. This, however, would not be the last time El Muerto was seen. Stories began to spread like wildfire that he was still riding in the hills and among the ranches he had once stolen from. The legend of the headless horseman of Texas is still alive and well today, as many ranchers and travelers throughout west Texas have reported seeing the ghostly apparition on clear and moonlit evenings; a large and foreboding presence, seemingly destined to an eternity of riding headless through the plains on a wild mustang. The Lone Star State is so vast it includes just about everything—including ghosts! 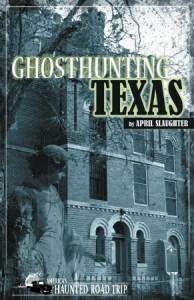 In her book Ghosthunting Texas, April Slaughter explores more than 50 spooky sites. About the author: As an active paranormal researcher for nearly 20 years, April Slaughter has delved into almost every facet of the unknown, from spirits and psychic phenomena to UFOs, Cryptozoology, and more. She is one of America’s leading researchers into the study of Electronic Voice Phenomenon (EVP), Instrumental Transcommunication (ITC), and is the first to introduce her personal experiences with Induced After Death Communication (IADC) to the paranormal field. She began her journalism career in 2006, writing and working for TAPS Paramagazine—published by the SyFy channel’s Ghost Hunters. In 2008, she cofounded The Paranormal Source, Inc., a nonprofit research and education corporation. 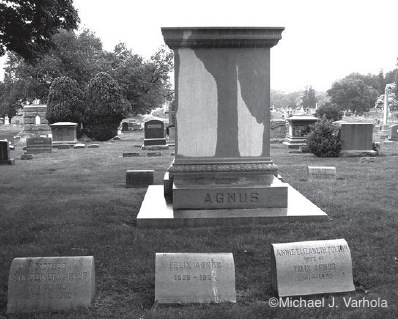 People have reported experiencing various paranormal phenomena— including sensing a spiritual presence, seeing apparitions, and capturing mists and orbs in photographs—at Druid Ridge Cemetery. One of the monuments often mentioned is the Marburg family mausoleum, in front of which is a bronze figure of Icarus. The base of this statue is fitted with a plaque dedicating it to Theodore Marburg Jr. and mentioning his service with the British Royal Flying Corps during World War I. The plaque also includes some rather strange verbiage about the need for an American presence in Europe. It also indicates that Theodore was born in 1893 and died in 1922, begging the question of how he might have died not during the war but four years after it ended. A brief review of Theodore’s life during and after the war would certainly suggest he was an almost classically tormented soul, and it was not hard to believe he might haunt the final resting place of his remains. When the Great War began, Theodore was a student at Oxford in England; in an effort to help stop the German advance across Europe, he joined the British Royal Flying Corps—despite the fact that Americans were prohibited from serving in foreign military organizations and that his father was a career diplomat and a friend of former President William Howard Taft. In 1916, Theodore’s plane crashed during a frontline mission and, as a result of the injuries he sustained, he had to have his left leg amputated. During his convalescence, he met and married a Belgian baroness who was a divorcée, the mother of a 3-year-old girl, and had a background that was, suffice it to say, a bit questionable. Not much about the couple’s life together is known, but two years later, when Theodore became a partner in a cattle ranch in New Mexico, the baroness refused to go with him. In an exception to the norms of the era, he claimed abandonment and they were divorced shortly thereafter. In early January 1922, Theodore was married again, this time to a woman 10 years his junior. She was not with him at his ranch, either, when he put an automatic pistol to his head seven weeks later and shot himself. It took him a week to die, during which the doctors had to remove his eyes. His wife arrived from Baltimore after he had expired. There is a lot that is not known about the mounting tragedies that afflicted Theodore in life, but it is not too hard to imagine that his tormented spirit might still linger on our own sphere after his earthly troubles had been brought to an end. But, as it turns out, a number of the other Marburgs have weird stories, as well, and it is easy to conceive of any number of them lingering on as ghosts. These include Theodore Marburg Sr., a man who cultivated a reputation as a peacemaker but urged the United States to enter World War I, and his sister, an increasingly desperate spinster who at one point unsuccessfully offered a European tour guide $200,000 to marry her (he declined, opting for her niece instead). Any of them—maybe all of them—might be among the spirits that continue to linger among the sepulchres and monuments of Druid Ridge Cemetery. 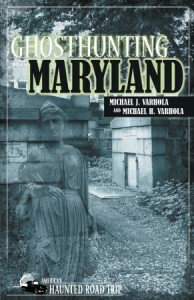 For more haunted tales, check out Ghosthunting Maryland by Michael J. Varhola. Helen Pattskyn shares with us the story of Seul Choix Lighthouse which she describes as one of the scariest places on earth. Although I’ve lived all my life in a state where more than 100 lighthouses dot the coastline, I had never actually visited one before venturing to Seul Choix Point, my first stop in the Upper Peninsula. I wasn’t sure what to expect when I got there. 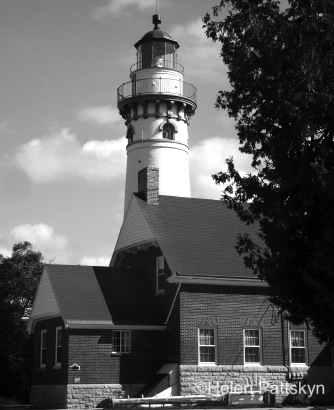 The Point’s 100-year-old lighthouse is reportedly one of the most haunted places in Michigan and was even featured on an episode of Fox Family’s Scariest Places on Earth. Even coming straight from spending a relatively quiet night alone at the haunted Blue Pelican Inn, I was feeling some trepidation as I approached my next destination. The battered blue sign telling me that Seul Choix’s historic lighthouse lay only 2 miles ahead did little to allay the feeling—neither did the slow drive up an old dirt road. Seul Choix Point is a narrow, rocky stretch of land that juts out from Lake Michigan’s northern shore into Seul Choix Bay, about a two-hour drive east of St. Ignace. The bay received its name, which means “only choice,” in the 1800s when a group of French fur traders took shelter there during a violent storm that threatened to capsize their small vessel. The bay was their “only choice” for safe refuge along the dangerous stretch of coast, which is known for its rocky shoreline and high waves. Those same waves make Seul Choix Bay a popular destination for surfers. I found a group of young men out enjoying the waves and warm early autumn weather the day I visited the Point, and I took a few minutes to talk to them. They didn’t know anything about any ghosts at the lighthouse; they were just out to get in a few more days of lake surfing before the weather turned cold. The Michigan State Congress commissioned the Seul Choix Point Lighthouse in 1886, but it took six years for it to become operational—I think sometimes we forget how much work went into building construction a century ago. The entire complex, which consists of the 79-foot light tower, family quarters, a steam fog signal and boiler house, stable, and a number of other buildings, wasn’t completed until 1895. Additional living quarters were added in 1925. Back then, the Seul Choix Lighthouse was the only guiding light for ships along a 100-mile stretch of treacherous coastline. The nearest towns are Gulliver—whose Historical Society, in cooperation with the Department of Natural Resources (DNR), oversees the upkeep of the lighthouse—and Manistique, a popular destination for boaters, campers, and hikers. The young lady behind the counter laughed. It’s a question she gets a lot. “The easiest way I know to pronounce it is Sis-shaw,” she told me. After getting that cleared up, I explained that I was writing a book about haunted places in Michigan and wondered if she’d ever seen or heard anything unusual in the lighthouse. “Not personally,” she said. Although several guests and other staff members told her they’d heard music, “like an old phonograph recording,” playing in the lighthouse. She said that some people also report that electronic devices, like the digital camera I was carrying, stop working. “The batteries just die for no reason,” she said. I definitely hoped that wouldn’t become a problem. Of course, I always carry extra batteries, just in case. I thanked her for her time and headed on over. The first thing that struck me when I walked into the house was how small the front parlor was. Yet at times in the lighthouse’s history, not only did the lightkeeper and his family live there, but his assistant and his family resided in the small dwelling too. That’s four adults and as many as six children. The lightkeeper’s home has been fully restored and is decorated with beautiful antique furniture—and seems about as far from scary as I could imagine a place to be. I quickly found Linda, the volunteer I was seeking, sitting in what had probably been a formal dining room. She looked up from her book and greeted me with a warm smile. As soon as I explained the reason for my visit, Linda invited me to have a seat with her so she could tell me about Captain Joseph Willie Townsend, the lighthouse’s primary ghostly resident. She described him as a bit of a prankster, but not a ghost she or any of the other staff had ever been afraid of. “He was originally from Bristol, England,” she said. 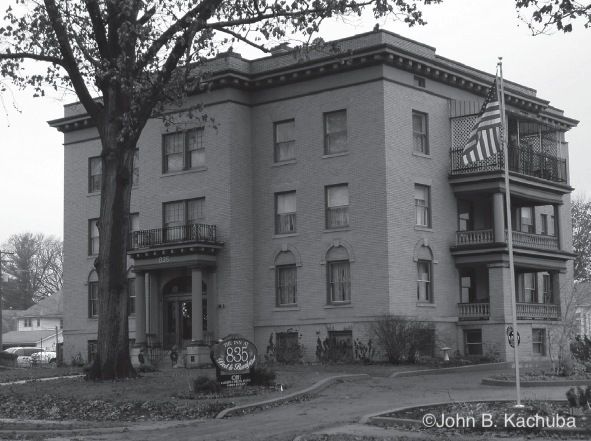 “Captain Townsend lived here from 1901 until he died of consumption in one of the upstairs bedrooms in 1910.” Consumption is an old-fashioned term for tuberculosis. “Because he died in winter when the ground was too frozen to dig a grave, the Captain couldn’t be buried straightaway, and his body had to be stored in the basement for several months.” Some of the paranormal investigators who have visited Seul Choix believe that might be why the captain’s spirit remains “trapped” at the lighthouse. Linda had her own ideas. She told me that the hauntings didn’t really start until a couple of original pieces of furniture were brought up from storage, when the lighthouse was last restored in the 1990s. One of the pieces in question is the kitchen table. “In England,” Linda went on, “you set a table correctly by putting the knife and spoon on the left and the forks on the right.” That’s the opposite of the way we set a table here in the United States. “The Captain doesn’t seem to like it when we set the table American style. 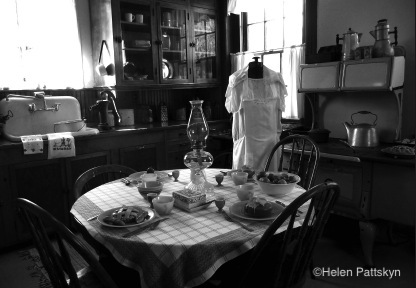 We always find the silverware reversed, even though no one’s been in the kitchen!” She laughed. Like the other rooms, the kitchen is roped off so that visitors can look but not touch. Numerous guests and most of the staff have smelled cigar smoke throughout the living quarters, even though no smoking is allowed in the building, and often there isn’t anyone else around. Linda told me that, despite his health problems, Captain Townsend was a heavy cigar smoker, and it seems that, even in death, he enjoys a good cigar. In the mornings several volunteers have found a “crescent-shaped imprint” on the bedspread in the room they’re pretty sure was the Captain’s. “It looks like someone sat down right on the bed,” Linda said. Some volunteers and visitors have reported seeing a man watching them from one of the windows, about halfway up the light tower—but no one was in the tower at the time. Probably the eeriest of Linda’s stories was one a guest told her. A woman was visiting the lighthouse sometime last year, and when she pulled in, she noticed a man wearing a heavy blue coat, walking across the yard to the lighthouse. Being friendly, she waved; he ignored her, but she didn’t think that much of it. Like me, she went to the gift shop first, then went over to the lighthouse, looked around, and headed on her way. When she got home, the woman started doing some research on the lighthouse’s history and realized that the man she’d seen in the yard was Captain Townsend! She contacted the lighthouse staff to tell them of her unusual encounter. I have to admit, hearing that gave me goose bumps! I thanked Linda for her time and went to have a look around for myself. Even though I had been told that a number of guests reported feeling the Captain’s presence on the staircase, I didn’t feel anything unusual. My camera continued to work too. I didn’t smell cigar smoke or hear music. Even so, I appreciate antique furniture, so I enjoyed walking around the small house. And I appreciated the staff’s sense of humor when I found the plastic Halloween skeleton hanging in an upstairs bedroom closet! I admit that it got me. I jumped. When I came back downstairs, Linda let me step into the living room, which is normally roped off, so I could get a better picture of the antique organ, where the portraits of past lightkeepers are on display. She also invited me to climb the tower. The lighthouse at Seul Choix is a working light station and one of the few where visitors are allowed to climb the tower. Of course, no one lives in the lightkeeper’s quarters today; the station is automated. A hundred years ago, however, the light was fueled by oil, which had to be carried by hand up to the light at the top of the 79-foot tower. Every two hours, the lightkeeper or his assistant hauled two heavy metal buckets up a very narrow spiral staircase. Because I’d never been to a lighthouse before, I decided to go ahead and make the climb—despite my horrible fear of heights. As I climbed the narrow metal stairs, I marveled at how a man twice my size had made the same trip four or five times a night, carrying heavy buckets filled with oil. I stopped at the midway point to catch my breath and enjoy the view from one of the windows—and got the distinct feeling that I was being watched. But no one else was in the tower with me. Of course, it might have been my imagination; I’d spent the last 40 minutes listening to ghost stories. Although my nerves threatened to get the better of me (because of the height, not the ghosts), I made it to the top. The view of the lake was spectacular. That alone made the drive worthwhile. The tower and lightkeeper’s quarters are open to visitors from Memorial Day through mid-October. Guests are asked to make a small donation that goes to the Gulliver Historical Society to keep the lighthouse running. In addition to the lighthouse and gift shop, Seul Choix Point has a beautiful public beach, where I stopped to enjoy my lunch and take more pictures before getting back on the road toward Marquette and the Landmark Inn. In Ghosthunting Michigan, Helen Pattskyn takes readers along as she explores some of her home state’s most haunted locations. Get your copy here. 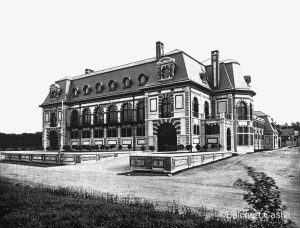 Belcourt Castle was built between 1891 and 1894 for Oliver Hazard Perry Belmont as a summer home. It was designed by Richard Morris Hunt, who used Louis XIII’s hunting lodge at Versailles as the model. Belmont’s wife, Alva Vanderbilt, added to the original structure with examples of English, Italian, and German architecture. 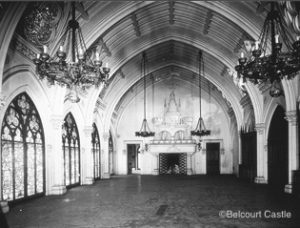 From 1933 to 1955, Belcourt (as it was originally called) passed through several owners and saw more neglect than restoration. 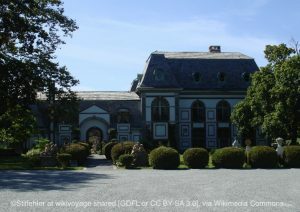 The property was purchased in 1956 by the Tinney family of Cumberland, Rhode Island. The Tinneys conducted massive renovations to the whole building and made it a showplace for their extensive collection of antiques. Harle Tinney is the last surviving member of the family since her husband’s death in 2006. Mrs. Tinney believes that the ghosts of Belcourt Castle are spirits who are attached to certain items that her late husband, Donald, and his parents brought into the house. One of those items is a small, wooden statue of a monk. 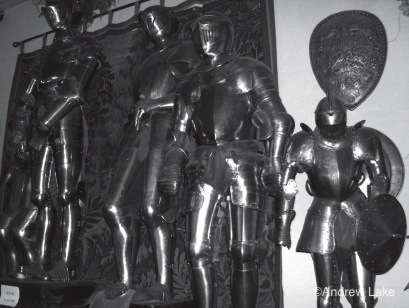 When the statue first came into the Tinneys’ possession, they placed it on display at their previous home. That was the first time they caught sight of the shadowy figure who seems to be linked to the wooden monk. 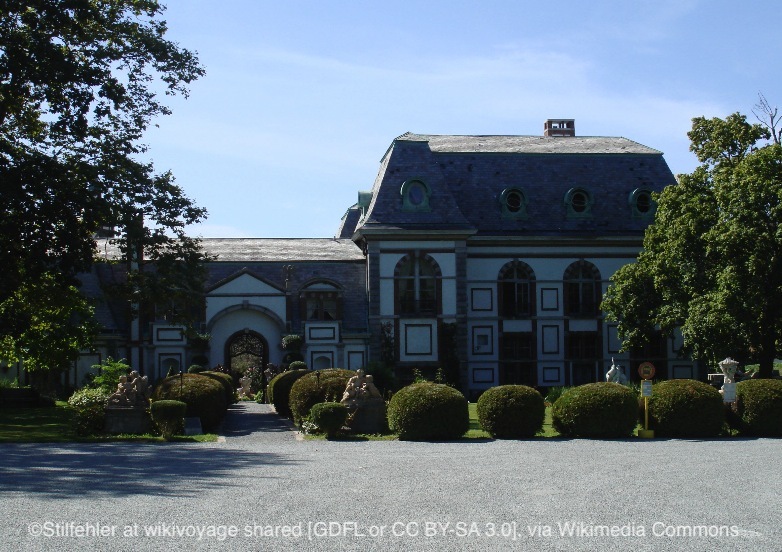 Two weeks after the statue was brought to Belcourt Castle, the dark figure was spotted again. Since then it has been seen no fewer than five times and always within the vicinity of the statue. Donald and Harle Tinney saw the ghost in the Great Hall when the statue was displayed there on a stand by the door to the ladies’ room. At first, they both thought the figure was Donald’s father. However, as the figure opened the door to the restroom the couple could clearly see it was not Mr. Tinney. What also struck them was the fact that the door, which always creaked loudly, emitted no sound. Donald and Harle found no one in the small room when they checked. The wooden monk is now kept in the Chapel Room on the first floor. It was moved there after a psychic told the Tinneys that the entity attached to the little monk wanted it placed there. That hasn’t stopped the dark shadow from making an appearance from time to time. The most recent sighting was on July 7, 2007, at seven o’clock in the evening. Belcourt Castle was playing host to a wedding when Harle Tinney saw what she thought was a guest heading in the wrong direction. She moved after the figure as it went into the foyer, but as she reached the spot she found no one there. The Gothic Ballroom located on the second floor has had its share of unsettling moments as well. One night in the mid-1990s, Harle Tinney heard three bloodcurdling screams while standing in the middle of the darkened ballroom. Her two dogs reacted to the screaming, but they were far too afraid to enter the room. There is an impressive collection of knights’ armor on exhibit in this room. The suits of armor are all excellent reproductions, except for one helmet that is known to be authentic and does show a battle scar. It is believed the knight who once wore the helmet haunts the armor and what Harle Tinney heard that evening were his death screams. The late Donald Tinney once heard the sound of a party in progress in the ballroom. It was late in the evening and the house was very still. When he went to investigate the phantom gathering, the family cat came along with him. It seemed to be well aware of the music and chatter. The cat started growling and the fur on its back and tail stood up when the two of them reached the ballroom. The sound then faded away into nothingness as Donald Tinney opened the doors to the room. This ghostly encounter is believed to have been a trace haunting of a happier moment in the home’s history, possibly from the Gilded Age. I spoke with Ken and Dave DeCosta, the father and son co-founders of the Rhode Island Society for the Examination of Unusual Phenomena (R.I.S.E.U.P.). Their paranormal team has been allowed into Belcourt Castle to conduct investigations and public ghost hunts. They told me that they have not seen or caught any of the ghosts on camera, but they have recorded examples of electronic voice phenomenon (EVP) throughout the property. Ken and Dave told me the EVPs that were recorded seem to be of a personal nature, so out of respect for the Tinney family they have declined to give me any further details on what the spirit voices said. The most interesting moment caught by R.I.S.E.U.P. on video was a session involving two electromagnetic field (EMF) meters. A member of the team asked if any spirit present could make the lights flash on one of the meters. After the lights on one of the meters flashed on and off, they asked if the spirit could do the same with the other EMF meter lying nearby on the same table. That meter’s lights flashed on and off while the first meter’s lights stayed off. The team continued asking the spirit to please go back and forth between the two meters and the lights flashed on and off as requested. All cell phones were switched off and no other electromagnetic interference could be found within the room. To explore the scariest spots in Southern New England, check out Ghosthunting Southern New England by Andrew Lake. Just across the Inner Harbor is Fort McHenry, the object of the battle immortalized in Francis Scott Key’s The Star-Spangled Banner, America’s national anthem. A symbol of freedom when it prevented British invasion during the War of 1812, the fort came to represent oppression to many pro-South Marylanders when the Federal government occupied it and used it to help maintain its grip over the local area during the Civil War. 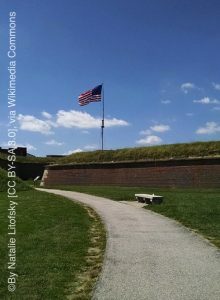 With such history and passions associated with Fort McHenry, it should not be too surprising that it has also long had a reputation for being one of the most haunted sites in a very haunted city. 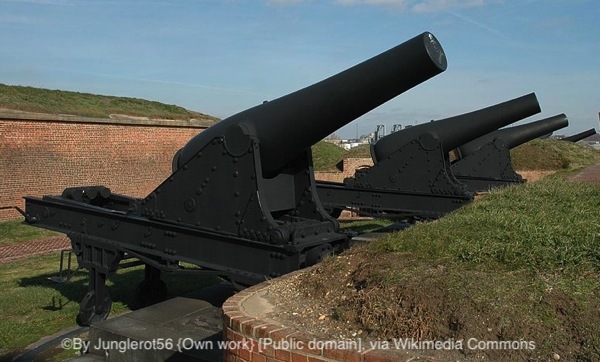 Over the years, all sorts of paranormal activities have been reported at Fort McHenry, including sightings of spectral figures on its earthen ramparts, disembodied voices, footsteps in empty areas, spots of unnatural cold, and furniture that levitates and otherwise moves around. Some investigators have even postulated that the fort’s shape—that of a five-pointed star—has some occult significance and might play a role in the preponderance of supernatural events that have occurred here. A number of specific ghost stories have also been associated with the site and recounted in numerous articles, television shows, and Internet postings. One of these involves the ghost of U.S. Army Lieutenant Levi Clagett, who, along with some of his men, was killed when a bomb burst not in the air but in their gun emplacement. Numerous people have seen both a spectral figure and a man dressed in a uniform appropriate to the period, walking along the top of the star point sometimes known as “Clagett’s Bastion” at times when no costumed people were present in the fort. Another named ghost associated with the site is that of Private John Drew, a soldier who was reportedly confined in one of the fort’s cells after he was caught sleeping while on guard duty and who, in shame, killed himself. His specter has been seen both in his cell and on the ramparts where he walked his last post, forever trying to correct the mistake that ended his military career and his life. 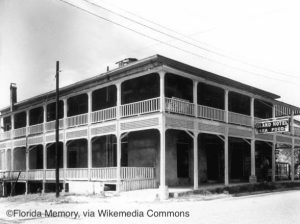 Some of the most dramatic paranormal events at the fort involve attacks on people by what has been variously described as a woman, a white figure, and an invisible entity that has reportedly done such things as push some people down stairs and knock others unconscious. 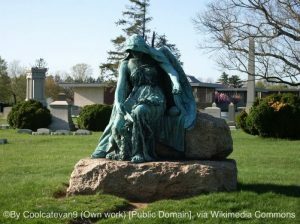 Some believe this spirit is that of the wife of a noncommissioned officer assigned to the fort whose children died during an epidemic in the 1820s. One ghosthunting group that recently visited the site is the Maryland Tri-State Paranormal. Founder Ana Bruder told me that while they were there, her friend Laura suddenly said, “I feel like I am being watched.” Ana, who is sensitive to the presence of spirits, turned and saw the ghost of a uniformed soldier staring at her friend, just one of several spirits she detected while at the site. 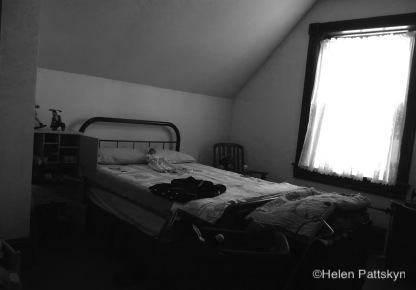 Numerous other ghost stories and episodes of paranormal activity have also been associated with the site. 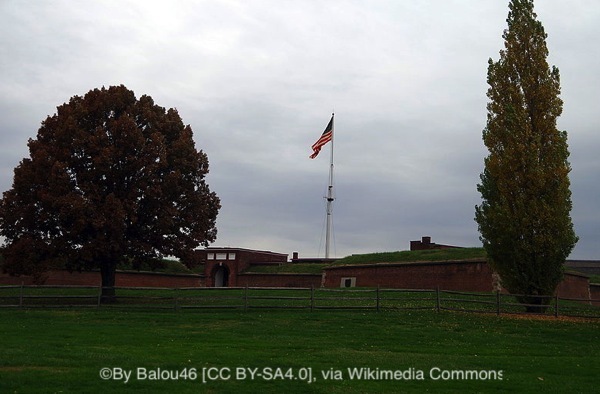 Many of the accounts of ghostly activity at Fort McHenry were originally reported by park rangers assigned to the site, and that remained the case up until a couple of decades ago. Today, however, in what they say is an effort to keep the site from being regarded as a “haunted fort” and to instead emphasize the non-supernatural history of the National Monument and Historic Shrine, the managers of Fort McHenry decline to directly comment on phenomena that are still regularly reported by visitors. Potential ghosthunters should also expect to have anything they ask to do at the site be curtailed by red tape. A favored tactic at Fort McHenry is to require application of a “special use permit” for anything its managers don’t really want people to do—the major exception to this being, it would seem, historic reenactment, for which the site has become a virtual playground. The important thing to remember is that the site is public property and that very little of what is involved in most investigations should actually require any sort of permission anyway. For more haunted stories from the Old Line State, check out Ghosthunting Maryland by Michael J. Varhola and Michael H. Varhola. At Arnaud’s get a meal, a museum visit and a ghost story! 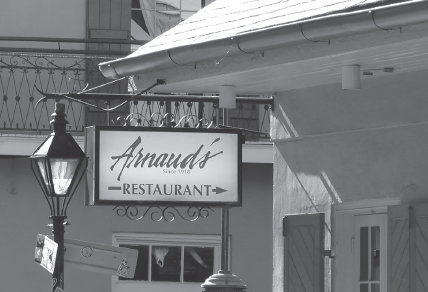 As you step off Bourbon Street and round the corner to Arnaud’s, you instantly feel as if you have stepped back in time and are preparing to dine like a real Creole. Founded in 1918, a French wine salesman named Arnaud Cazena built the restaurant. A variety of private dining rooms, as well as a museum filled with New Orleans memorabilia on the second floor, are inside. The museum includes elaborate Mardi Gras costumes worn by Count Arnaud and his daughter, Germaine Wells, who reigned as queen over 22 Mardi Gras balls, more than any other woman in the history of Carnival. 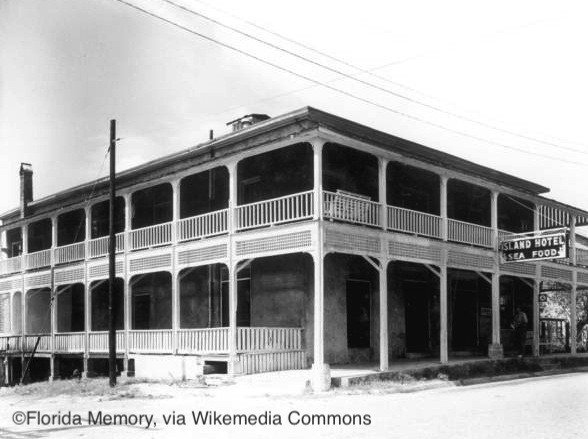 There have been hundreds of paranormal sightings at the restaurant, including a ghostly gentleman standing near the beveled glass windows, who has been seen by employees. At first the tuxedo-clad man is noticed standing alone. When approached, he immediately disappears. Most believe that it is Count Arnaud checking in on the restaurant. Others report seeing a woman wearing a hat exiting the ladies’ room and crossing the hall, where she then walks into the wall and disappears. There have been so many reports of this sighting that investigations were held to determine the original structure and layout of the building. It was discovered that this area once had a staircase where the wall is now placed. The ghostly woman is simply walking to the stairs from the time when she was here; in her world, there is no wall there to block her entry. Some believe this ghost to be Germaine, the daughter of Arnaud, who still enjoys the restaurant as well. She reportedly also appears in the museum by her costumes and has been seen in her ghostly form at various Carnival balls each year. 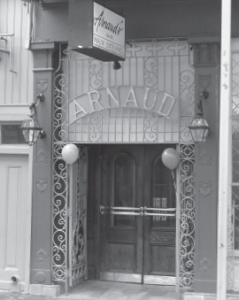 Beyond the supernatural sightings reported by local diners, tourists, and waitstaff, Arnaud’s reports that even its CPA experienced a ghostly visitation in the restaurant when he was alone one evening conducting inventory. While he was working, he noticed a strong drop in temperature in the room. As he felt the cold chill overtake him, he became aware of a presence standing behind him. Turning around, he found himself alone in the room. The CPA was in the Richelieu Bar at the time, which is one of the oldest standing structures in the restaurant, dating back to the late 1700s. In a building still standing for several centuries, there is the opportunity for a wide variety of hauntings over its incarnations. Over the years, so many different ghosts have been seen and felt at the restaurant that not all of them have been identified by name. When dining at Arnaud’s, try the Oysters Bienville with shrimp, mushrooms, herbs, and seasonings in a white wine sauce; it’s elegantly delicious! Join Kala Ambrose, author of Spirits of New Orleans: Voodoo Curses, Vampire Legends and Cities of the Dead, your travel guide to the other side, as she takes you back to her roots to discover the Spirits of New Orleans.